Science never ceases to amaze me. We can clone all sorts of things today from sheep to pets and we can even grow disgusting human ears on the back of bald mice. Perhaps the best use for science ever is to re-create a 170-year-old variety of beer. 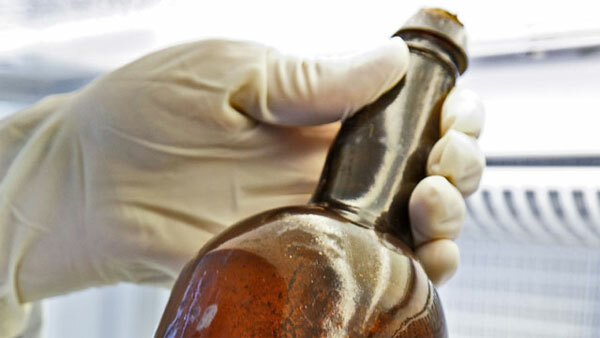 The old bottle of beer seen in this picture was recovered from a shipwreck discovered in 2010. The wreck is believed to have sunk in the 1840s, and has already given up its bountiful booty including the world’s oldest bottle of champagne considered drinkable. That champagne was auctioned off and now scientists have turned their tech to a bottle of beer discovered in the wreck. According to the researchers, the beer they analyzed had not stood the test of time well, but did retain its pale golden color. The scientists believe the beer originally had hints of rose, almond, and cloves. The researchers say that with their chemical analysis and the help of a master brewer it’s possible to re-create the beer so beer fans can have a taste of what sailors drank 170 years ago.